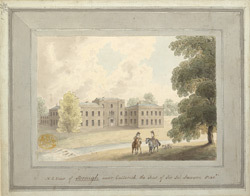 View of Brough Hall, the Seat of John Lawson, Bart. Langdale's Yorkshire Dictionary (1822) describes Brough as 'rendered highly picturesque and beautiful by the venerable woods, verdant lawns, and smooth lakes, which surround the stately mansion of Sir H. Lawson'. It explains that 'Brough-Hall formerly belonged to the ancient family of Brough, from whom it had its name, and from them came into the present family by marriage. It has been built above 200 years, but considerably improved and altered to its present state, by the last Sir John Lawson, who added the wings'. Sir John Lawson employed local architect Thomas Atkinson, to do the work.